Ole Tersløse has build a tall outdoor installation named "Altar in the Woods" in Skovsnogen Art Space - a danish outdoor museum of art. 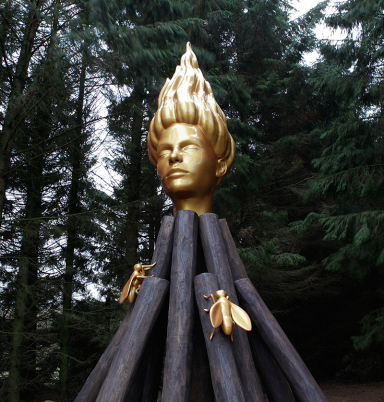 Ole Tersløse's installation may look like a camp fire but the flame on top of the wooden structure is also a 3d print of a woman's head with peacefully closed eyes as if she´s meditating. Three 3d printed flies are resting on the wooden structure as if they were attracted by the light from the campfire. Are we able to reconnect to nature, when we go back into the woods and sit at the campfirelight in the forest, or do we remain alienated because our conscience and culture create a gap between ourselves and the outside world? What do we find, if we continue to look into the flames? Revelations from the spirit world, or are we just confronted with our own projections?